As I mentioned in my earlier posts this week, Easter is celebrated in Italy by eating egg and lamb. So it was a given that the main course for our Easter dinner would be lamb. To make it even more appropriate for Easter, the sauce of this lamb dish is made with an egg yolk. 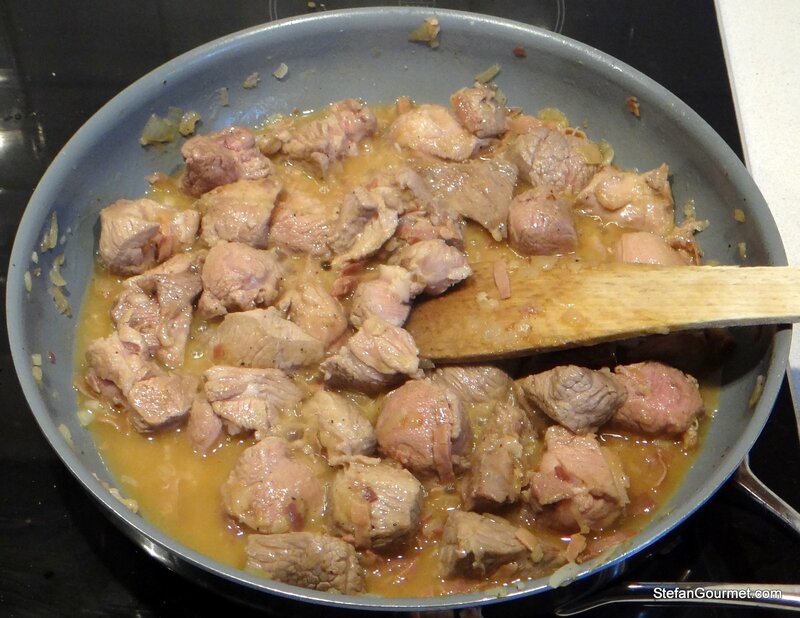 Abbacchio Brodettato is a lamb dish from Lazio, the region around Rome. 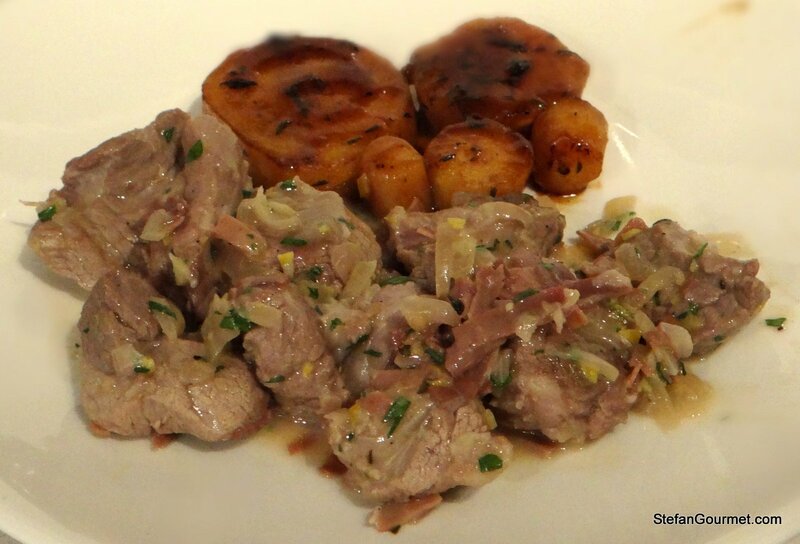 Abbacchio is suckling lamb, but any young lamb will do to make this dish. This dish has a very original taste, as lamb is not often combined with prosciutto, lemon, and egg yolk. 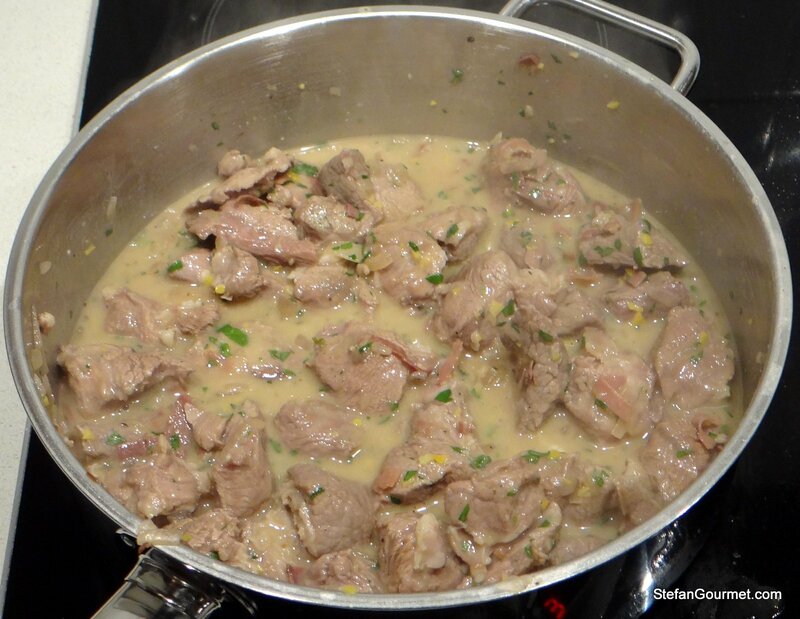 It works very well and the lamb is very tender. 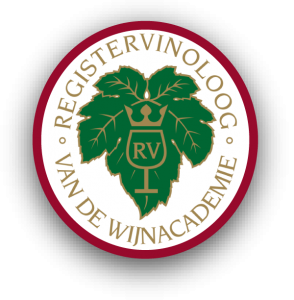 It is almost like eating white meat, and therefore it can be no surprise that a full-bodied oaked white wine is a better pairing for this than red wine. As the lamb is stewed, I couldn’t resist preparing it sous-vide. 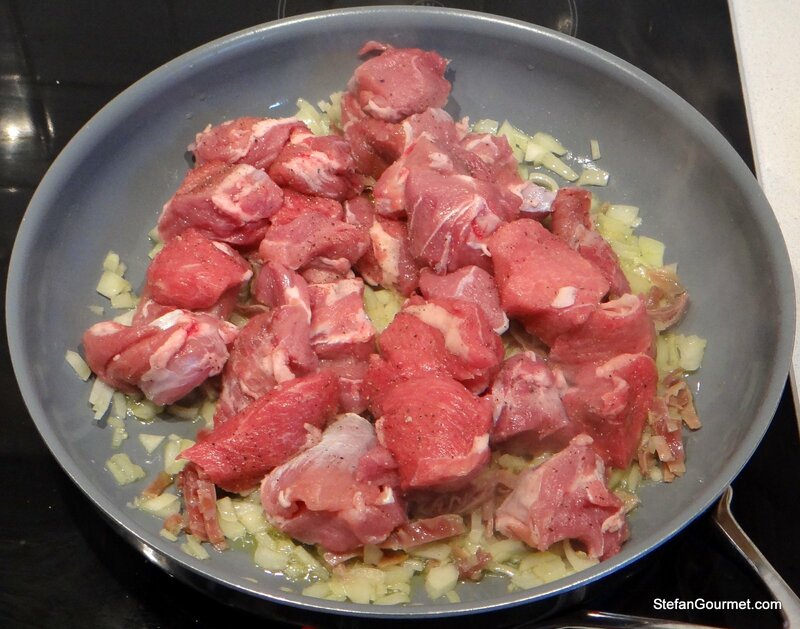 You could of course also prepare this on the stove, just make sure you use very low heat to prevent the lamb from drying out. 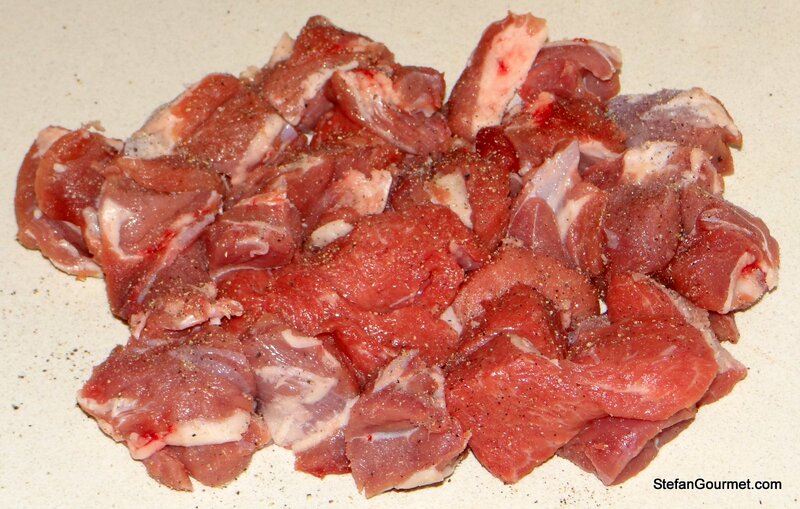 Dry the meat with paper towels and season with salt and freshly ground black pepper. 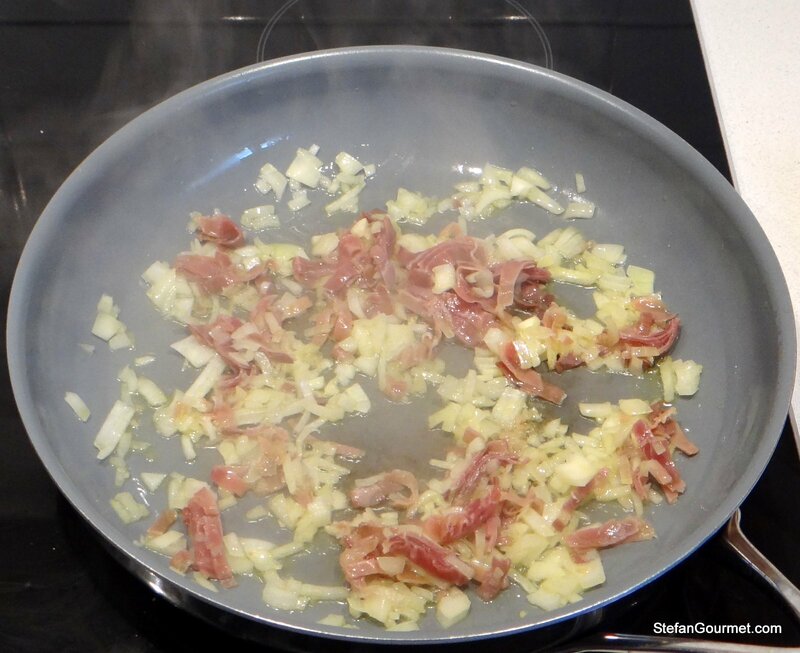 Heat the oil in a frying pan and sauté the onion and prosciutto until the onion is translucent. 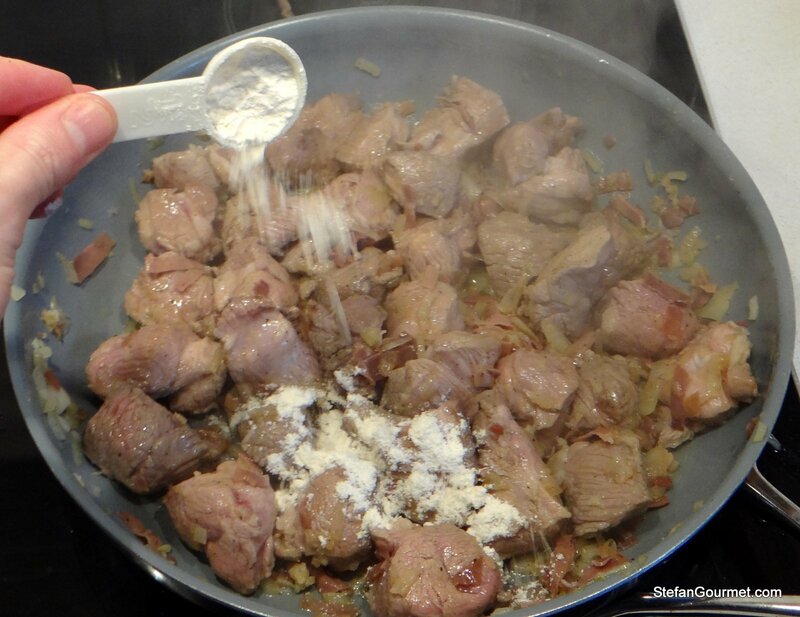 Add the lamb and brown quickly on all sides over high heat. Lower the heat and add the flour. Stir to mix. Bring to a boil and then lower the heat. 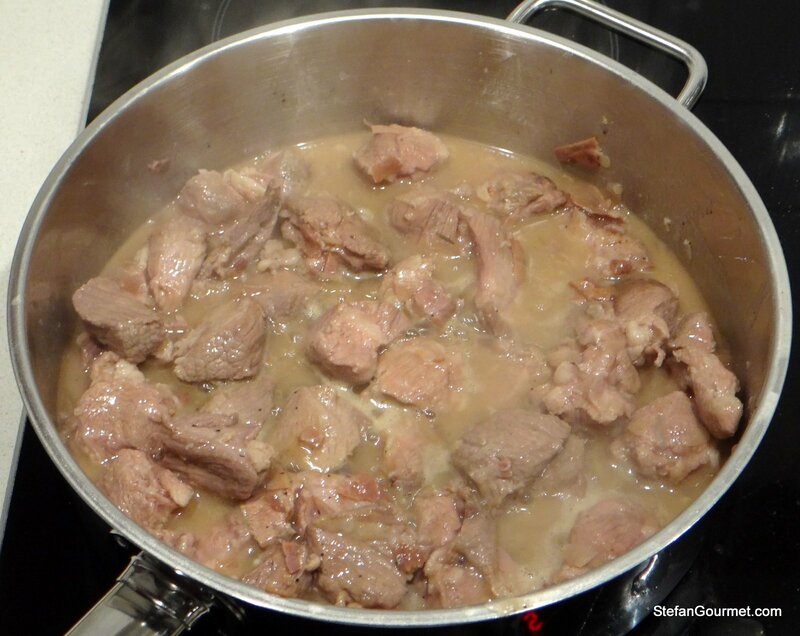 If cooking traditionally, lower the heat to very low, cover and simmer until the meat is tender (about one hour). If cooking sous-vide, transfer the contents of the pan to a zip-loc sous-vide pouch and seal it with as little air as possible using the water deplacement method. Cook sous-vide for 24 hours at 57C/135F. After cooking sous-vide (I neglected to take a picture, sorry), transfer the contents of the pan back to the pouch. 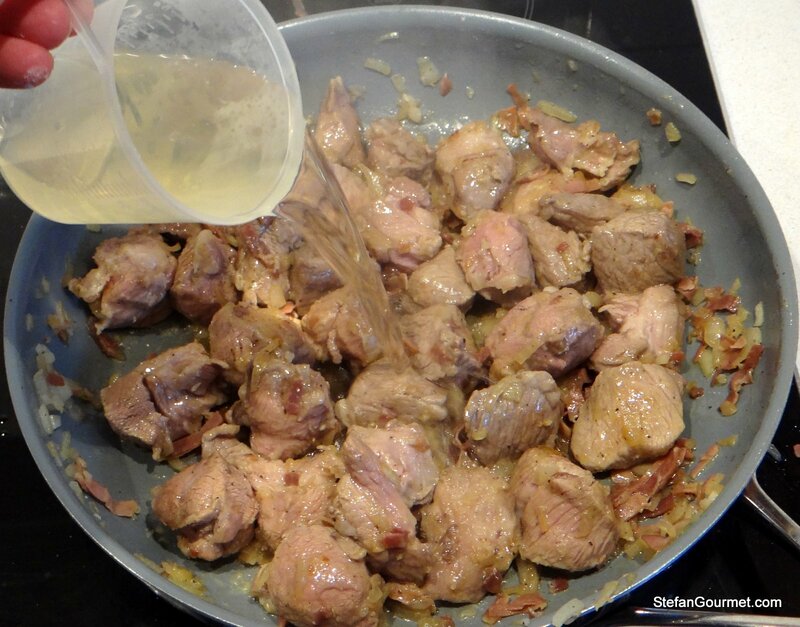 If you’d like to concentrate the sauce, start with the liquid only, cook it over high heat, stirring, until it has reached the desired thickness, and then add the meat. 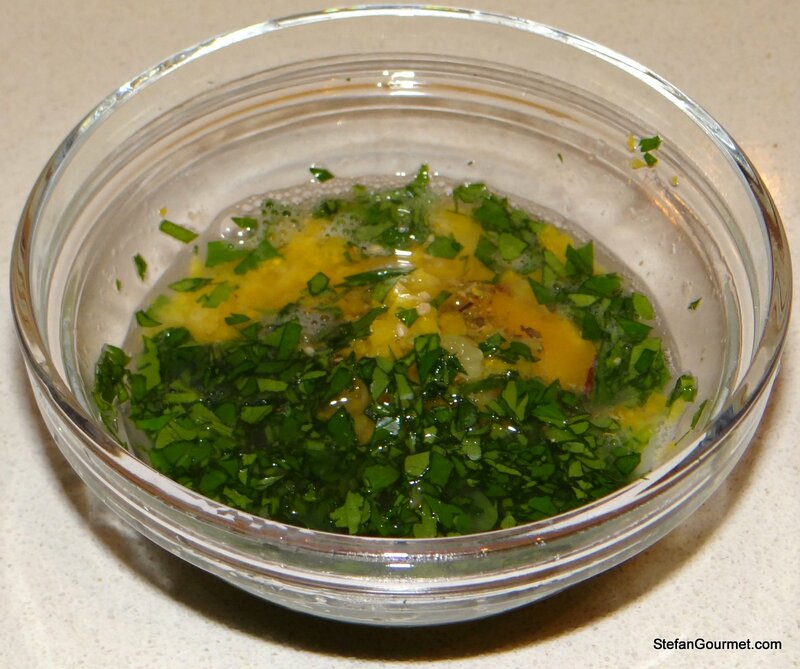 Combine the egg yolk, the lemon juice, grated lemon zest, the parsley, and the oregano in a small bowl. Stir with a fork until well mixed. 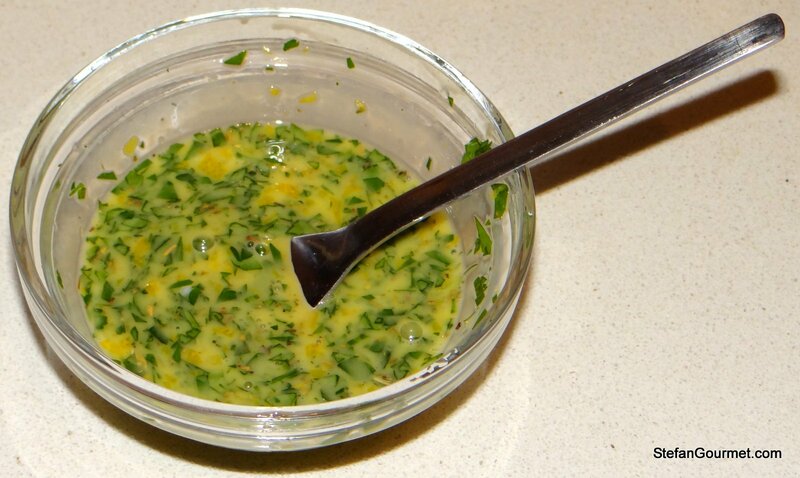 Lower the heat and add this mixture to the meat. Stir and cook over low heat for 1 minute. Serve immediately on warm plates. Like I already mentioned in the introduction, this pairs best with a full bodied white. We enjoyed it with a Verdicchio dei Castelli di Jesi Riserva, partly aged in new oak barriques. Even in Italy I think this is mostly eaten only in Lazio, the region of Rome. I have never seen it on restaurant menus elsewhere. Very different. Thought provoking ingredients. I imagine it was very tasty. . This is completely new to me, Stefan, but would I ever like to give it a try. I bet it’s delicious and that egg has me intrigued. I can’t wait to show it to Zia. I doubt if she ever made it — I’d remember — but she may know of the dish. Better still, it may remind her of another, long-forgotten recipe. Great post, Stefan. 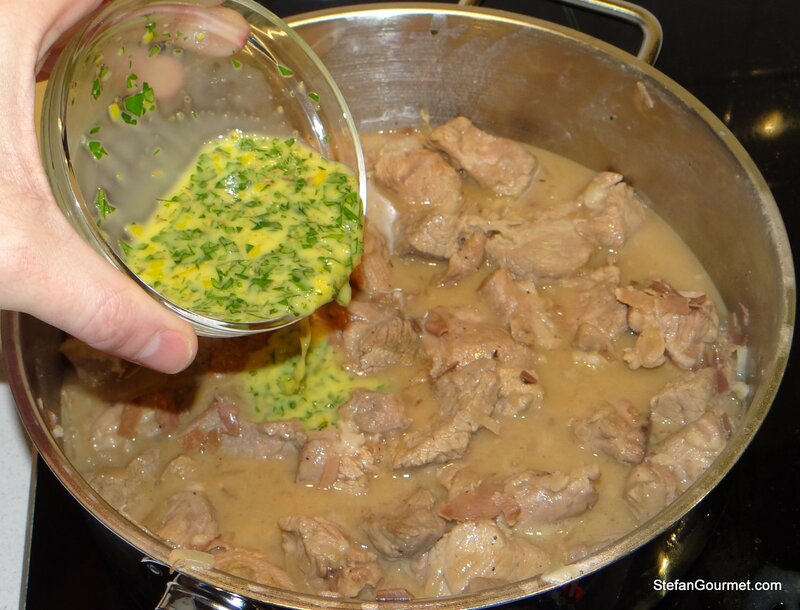 Never thought about using a lemon sauce with lamb. Neither did I, but it was very nice.